Bagster vs Dumpster Rental for debris removal and pick up! 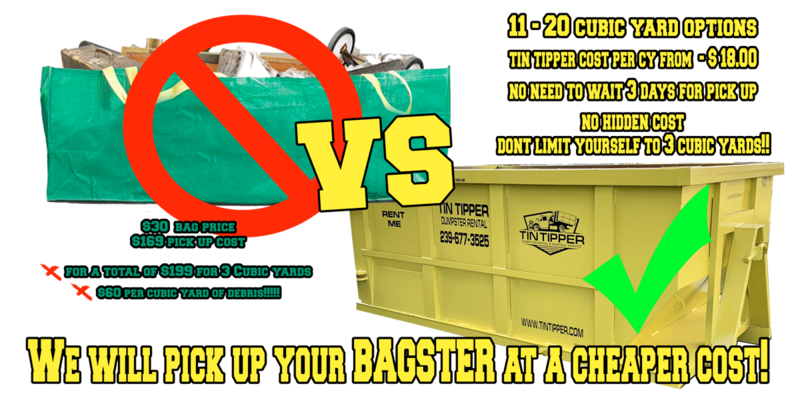 Both the Bagster and Dumpster will help you declutter your home! Both of these debris removal devices have there pros and cons. Before you purchase either products do you homework as to what will work for your next debris or junk removal project. Below you will find a good overview of what to expect from both the Bagster and our Tin Tipper Dumpster Rental. What is the Bagster ? The Bagster is a heavy duty bag like product with soft collapsible walls that makes it hard to fill properly. It is offered in Cape Coral, Fort Myers, Punta Gorda, Bonita Springs, and Sanibel for junk removal of up to 3 Cubic Yards ( or about the size of 1 pick up truck bed). Customers purchase this bag at a local big box stores such as Lowes or Home Depot. The bag is then filled with your debris to be removed. Once you are completed with your project, The manufacturing company must be called to schedule a pick up. The pick up is NOT free in our Cape Coral / Fort Myers area. You must ensure that the dumpster bag is placed within sixteen ft of the curb or street side so the truck hauler can access the bag with its mechanical claw / grabber. The #1 complaint on Amazon is from this companies inability to pick up the dumpster bag. Cost Associated with the Bagster? The Bagster service includes the purchase of the heavy duty bag at a cost of $30.00, the pick up will then cost you $169.00 in cape coral, fort myers, and surrounding areas. The total price for you to remove your debris or junk will be $199. Most people are under the impression that purchasing the Bagster is the all-inclusive price, no hidden fee kind of deal! Only to later find out that there is an additional pick up and disposal fee. Tin Tipper has been picking up bags from Cape Coral / Fort Myers customers due to unhappy customers with the unexpected second charge. What if you need 2 or more dumpster bags ? There is an additional cost of $159.00 per additional bag to be picked up. This is where you truly see the benefits of renting a dumpster through Tin Tipper. Our 10 cubic yard dumpster can be rented for $280.00. Thats an $80 savings plus an additional 4 cubic yards of debris that can be removed. It's pretty clear to see that renting a dumpster will easily benefit the residential customer. Click here to see the pick up price for the Bagster. WM's Bagster is one of the most popular options for residential debris removal. In this next section we will highlight price comparison between the Bagster and our Tin Tipper Dumpster. Keep it ming that this is definitely not an apples to apples comparison as the Bagster holds 3 cubic yard of debris and our dumpster hold 10 cubic yard of debris. However, you will find that the pricing and hassle of the Bagster will never beat the convienence of our dumpsters. 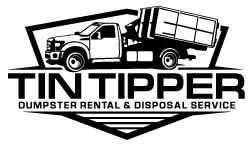 Renting a residential dumpster is available from Tin Tipper which is a locally owned and operated dumpster service. 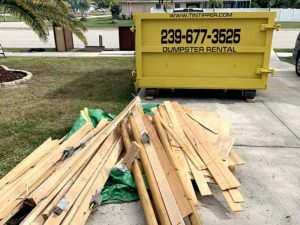 Simply contact our dumpster rental company serving Cape Coral, Fort Myers, Sanibel, Punta Gorda, Bonita Springs, Estero, and surrounding areas. Set up your dumpster size needed, delivery date, and delivery to your location. When your done with your debris removal project call us back and we will schedule a pick-up. Best of all, you do not have to be present for the delivery or pick up of your dumpster rental! Call to have the dumpster picked up when you're done! $30 for the bag, $169 for the pick up fee. The Bagster claims to hold 3 cubic yards of max capacity. The size of the Bagster is 8'x4'x2.5'. Because of the extremely low sides and the restrictions against overfilling the Bagster with your debris. This will be very difficult to get rid of any debris that isn't being substantially broken down. We have broken down the cost per cubic yard of debris to be at $64.00. Clearly the pick up service and costs are extremely restricted, since this is a nationally owned company, the ability to help and assist the customer isn't a priority. We have found that once you start getting rid of junk / debris, it tends to multiply after you have the dumpster bag or tin tipper dumpster. removal of debris and junk is always contagious. It will feel oh so good to have an uncluttered home and free yourself from , and you'll almost always find more junk to get rid of. Give us a call! We can pick up your Bagster debris bag today. For this comparison we will use our 10 cubic yard dumpster. Cost : $285.00 for a cost of $28.50 per cubic yard of debris. Size : 12' x 4' x 7' with a full size door in the rear of the dumpster for ease loading. 10 Days Dumpster Rental included in the price. NO HIDDEN FEES / UP FRONT PRICING! A 10 yard dumpster does cost a little more than the dumpster bagster. Tin Tipper 10 Cubic Yard Dumpster holds more than three times more debris / junk / trash. The convenience of dealing with a local business, the ease of loading the dumpster, and additional room makes this an easy choice! Have you already purchased and filled the bagster ? 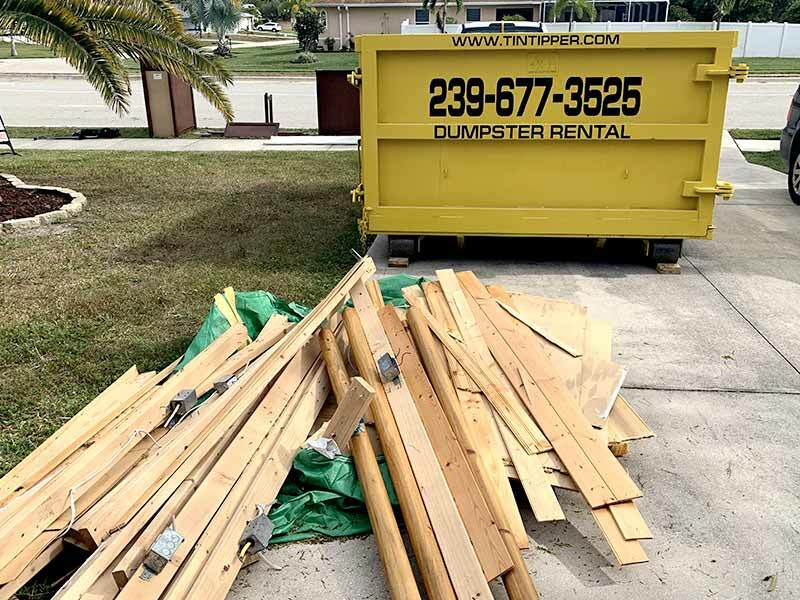 Give Tin Tipper Dumpster Rental a call for a free estimate, you can text us a picture of the bag at 239-677-3525. We can come pick it up and save you some money!